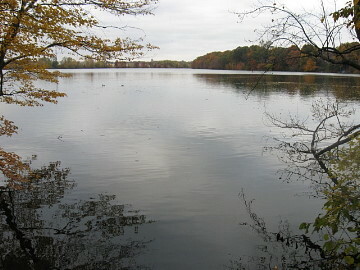 Mashapaug Pond is located on the South Side of Providence, bordered by Adelaide Avenue on its northeast edge, the Huntington Business Park on its northwest edge and Ocean State Job Lot off Reservoir Avenue to the south. 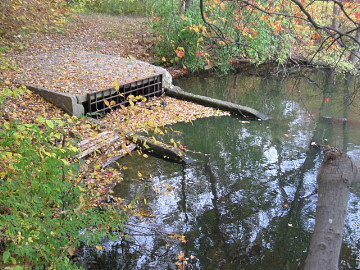 It is a part of the Pawtuxet River Watershed--the largest watershed in Rhode Island--fed by the waters of Tongue and Spectacle Ponds in Cranston and in turn feeding into the Roger Williams Park ponds. From there, water ultimately ends up in Narragansett Bay. It was once a thriving Narragansett settlement, part of the land Roger Williams acquired from the Narragansett in 1636. In the early 1800s, its shores became home to an ice harvesting company owned by the Carpenter family, and by 1890 became the heart of American silver manufacturing when Gorham Manufacturing Company started operations on its eastern shore. Now, due to surface water run-off and industrial discharges, Mashapaug Pond is highly polluted. Its waters are not safe for swimming or drinking, its fish are poisoned, and the former Gorham site groundwater and soil, including the pond's cove, are contaminated with toxic metals, solvents and combustion waste products. Thanks to the remediation efforts in place, students at Dr. Jorge Alvarez High School have access to clean open space that they never had before. Groundwater continues to be treated by extraction and air stripping, a process that is expected to continue for some time. All contaminated soil from affected land around the high school has been either removed off site or, where appropriate, capped by engineered controls (parking lots, sidewalks, buildings, clean landscaped areas) to prevent exposure. Mashapaug Cove has been dredged and its sediment safely stored onsite. The wetland areas around Mashapaug Cove that were disturbed during the remediation activities were all restored. The remediated surface area was loamed and seeded, and all areas are now revegetated. Students from our school and other schools use the field west of the school for sports, and students visit the wooded area adjacent to the pond for classroom activities. Members of the Alvarez community are excited about the upcoming park to be constructed on the area behind the shopping plaza near the railroad tracks. Construction is expected to begin soon. The contamination the Gorham factory left behind is not the only source of pollution for the pond, but contaminants in the groundwater under the site continue to flow directly into the pond and add to its pollution burden. 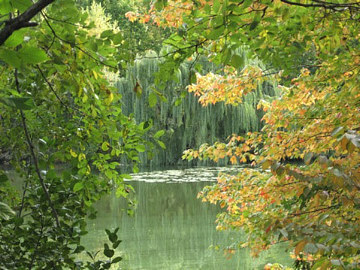 Therefore, remediating the groundwater as well as preventing exposure to contaminants in the site's soil are essential to restoring the pond as a public recreation and natural space in the city. Local resident Ana Quezada, who lives next to Mashapaug Pond, speaks about why it's important for us to care about and address stormwater pollution. ​Ana Quezada is now serving her second term as a Rhode Island State Representative. She credits her involvement with UPP Arts and the Environmental Justice League of Rhode Island for her knowledge of environmental challenges facing Rhode Island, advocates for environmental preservation bills and serves on the education and commerce committees. Max Green from the Conservation Law Foundation describes how stormwater runoff pollutes Mashapaug Pond. After negotiations with EPA failed to bear fruit, we litigated in federal court in both Rhode Island and Massachusetts simultaneously. In RI, Judge Lisi dismissed our case in December 2016: https://ecf.rid.uscourts.gov/cgi-bin/show_public_doc?2015cv0165-25. A dismissal of the MA case followed. We consolidated the cases for appeal to the U.S. Court of Appeals for the First Circuit, which affirmed the dismissals in January 2018: http://media.ca1.uscourts.gov/pdf.opinions/17-1166P-01A.pdf. Soon after this, Max moved to Portland, Oregon. Sign up for the UPP Mailing List to get periodic updates about meetings and events by emailing holly@upparts.org with the subject line "SUBSCRIBE". Follow developments on www.ejlri.org about the Gorham factory site cleanup and other related issues. Attend public meetings concerning Textron's remediation of the former Gorham site and the EPA-funded clean-up of the Roger Williams Park Ponds. 1) Putting waste in its place! Don't feed the ducks and geese. Put waste and litter in trash cans. Avoid using pesticides and fertilizers on your lawns. Plant trees, gardens and grass which will absorb and filter runoff. Don't swim or eat fish caught in the pond. Wash your skin with soap and water after contact with pond water. Avoid contact with pond water during algae blooms, which are toxic and can increase after a rainfall. Wipe your feet after leaving the pond to prevent tracking contaminated sediments into your car or home.